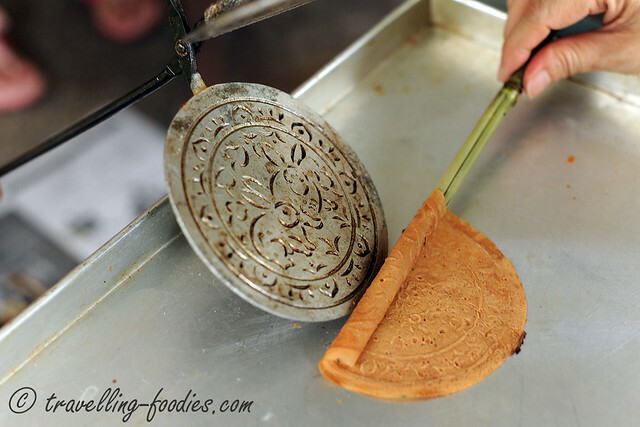 When I was very young, I’d watched my grandmother, aunts and my mum make kueh belanda over a charcoal grill just along the corridor outside my grandparents’ flat. It was a sheer exhibit of teamwork as some would be in charge of pouring the batter over the moulds, while others would do the watching over and scrapping the edges of the moulds to remove the excess batter and of course to roll the love letters when they were freshly out from the moulds. It was a feast of sight, sound and smells! They worked with clockwork precision, each “manning” their own designated task well, yet being able to chitter chatter and make small talk about the latest “market gossips” they have garnered. And of course, the unmistakable aroma from freshly charcoal grilled kueh belanda, my oh my… is so strongly imprinted in my memory that I hardly eat the store-bought ones anymore even as my family stopped making them after Grandma passed away. Anyway, let’s talk about the making process. The painstaking task of making kueh belanda begins with squeezing freshly grated coconut. Be sure to use freshly grated coconut whenever you can and not those in tetrapaks or cans off the supermarket shelves. Trust me, the taste and more importantly aroma freshly squeezed coconut milk impart unto the kueh belanda are far more superior than those made with pre-fabbed ones. If you are lucky, your grated coconut seller may have a machine that would do the squeezing for you, otherwise do it the traditional way of using a muslin bag or like us, a potato ricer over a fine-wired sieve. The latter is almost effortless compared to squeezing the grated coconut in a bag or with bare hands. Trust me, we learned it the hard way. 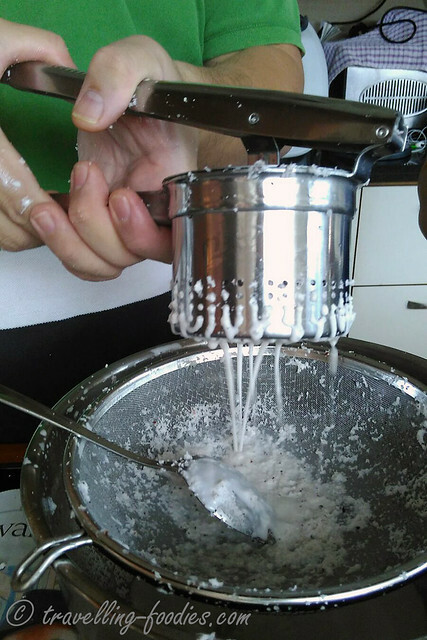 After the coconut milk is processed, the batter can be made. 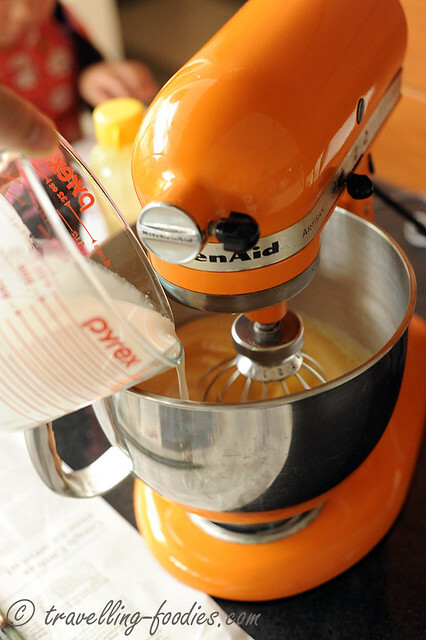 Using a stand mixer with a balloon whisk would be ideal. Otherwise a handheld mixer or even manually whisking it is also fine as the process only requires one to make sure that all the sugar and salt are well dissolved into the batter. It would be easier if the eggs were at room temperature of course. After the sugar has dissolved, coconut milk is added, followed by the flours. A quick and good mix to get everything homogenised and the batter is ready to be used. The technique of “flooding” the moulds with batter is important to get each love letter thin and crisp. The pre-heated mould has to be placed over the mixing bowl tilted while a generous ladle of the batter is being poured over the surface. Upon contact with the hot mould, the batter begins to cook almost instantaneously, producing a soft hissing sound which develops into a whistle as the mould is closed. This “pre-cooking” process ensures that the batter clings onto the mould when it is well heated. Tilting the mould allows any excess batter to drain back into the bowl thus ensuring that a thin and uniform coat of batter remains on the surface of the mould which in turn produces uber crisp and thin love letters. 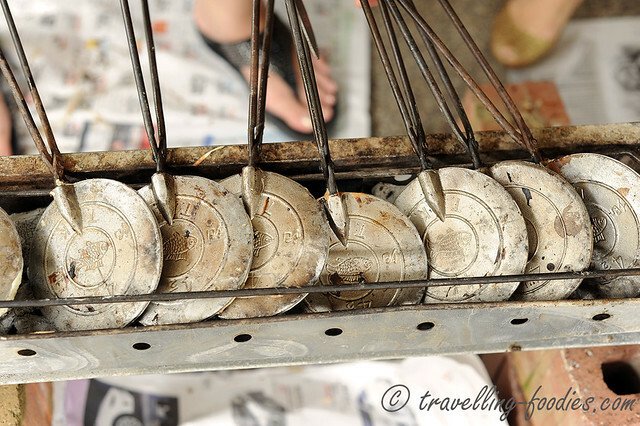 This is something which one make have difficulty replicating with those electrical moulds fashioned like waffle makers, not to mention the aromas from a charcoal grill. The love letters can also be folded instead of being rolled of course. 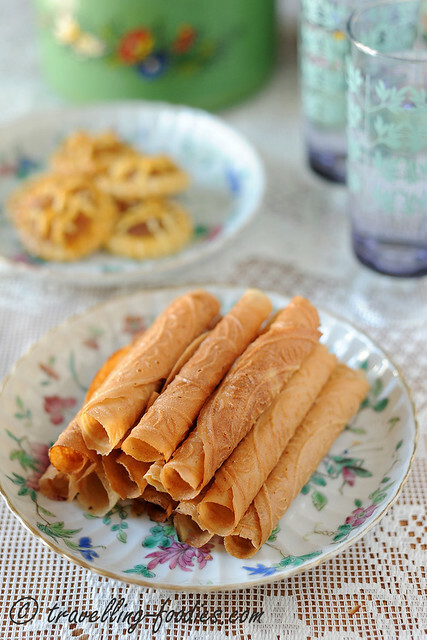 It seems like the Malays who call the love letters “kuih kapit” are more in favour of the former while the Peranakans prefer to do the latter. We never had the folded ones when I was young. 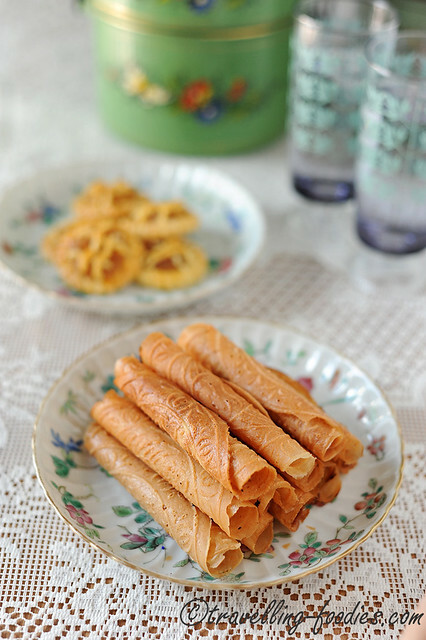 It was always rolled which my cousins and I would fool around with, using them as “cigarettes” by clasping the kueh belanda in between our small fingers mimicking my uncles and Grandma smoking, much to the dismay of my mother of course, but to the amusement of the other adults. Yes it is going to be a long and tiring process. But at the same time, it would be fun and very fulfilling, trust me. 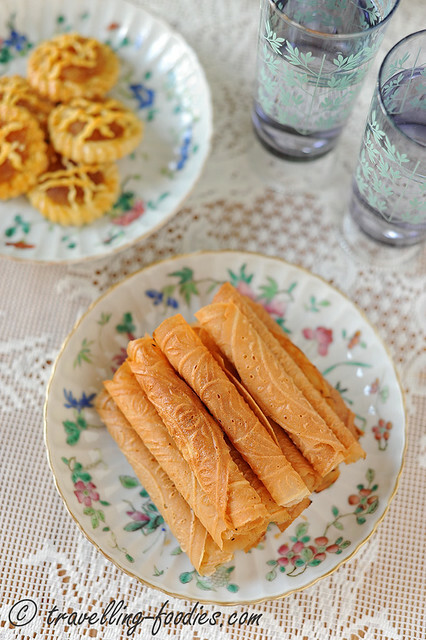 The feeling of enjoying our very own homemade kueh belanda is something which I remember vividly despite not having made or seen them being made for the last 20 over years and would definitely continue to remember for a long time to come. Make them with loved ones and good friends, so that despite the long hours in front of the hot stove, there will never be a dull moment. 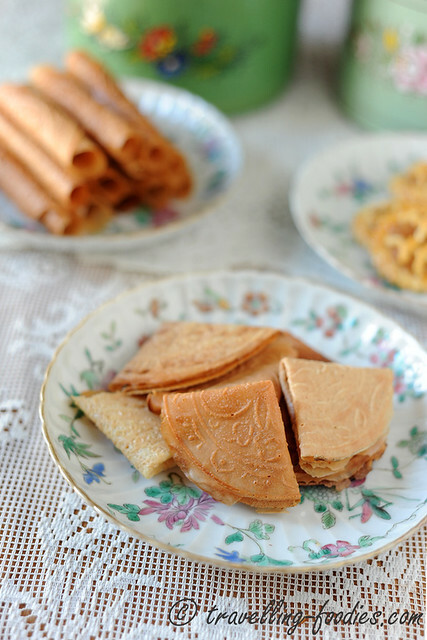 And make them with your kids, so that they could better appreciate how these delectables were traditionally and painstakingly made, in hope that it would get them interested in the kueh making process and the cultural significance it entails, just as our mothers and grandmothers had inspired us. To a mixing bowl, add eggs, salt and caster sugar. Whisk at medium speed until the sugar dissolves. Add fresh coconut milk and whisk for 20-30 seconds or so. Add rice flour and tapioca flour and mix well, remembering to scrape down the sides of the mixing bowl at least once during the mixing process. Strain the mixture over a fine-wired sieve into another mixing bowl to remove any flour lumps, unbeaten egg. Set aside while the charcoal grill is being prepared. Heat the love letter moulds over a heated grill until hot. Allow most of the excess batter to drain back into the mixing bowl before closing the mould and place it back on the grill. Grill the love letter until it is nicely light golden brown. The actual grilling time depends on the temperature of the grill. 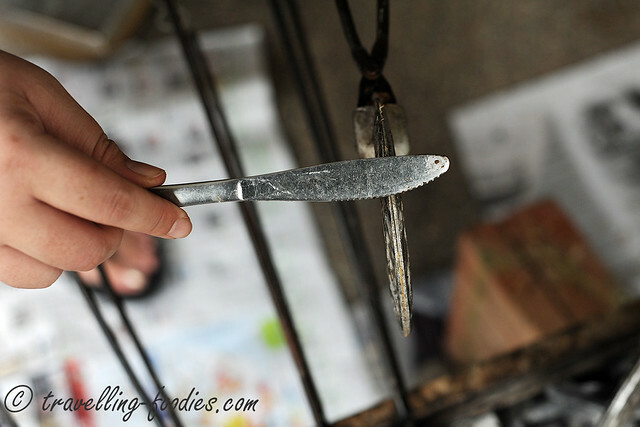 While grilling, scrape away any excess batter which had seeped out from the edges with a butter knife. Once the love letter is of the right colour, remove quickly from the mould and either fold it into quarters or roll it into a thin cigar-like shaped cylinder. This has to be done within a few seconds after the freshly grilled love letter is out of the mould. Otherwise it would harden and crisp up very rapidly as it cools down. Leave the rolled or folded love letters to cool down to room temperature before storing in an air-tight container. Do not wait for too long or the love letters would soften with the humidity. It takes a bit of experience and practice here. Repeat the process until all the batter is used up, taking note to stir and homogenise the batter in the mixing bowl thoroughly each time before pouring over a newly heated mould to prevent the flour from settling at the bottom. *** the greasing process is only done for the first round. Subsequent rounds of love letter making with the same mould does not require greasing. ** If the mould is sufficiently hot, there will be a soft hissing or whistling sound produced as the thin coat of batter begins cook over it immediately as it is being poured over. 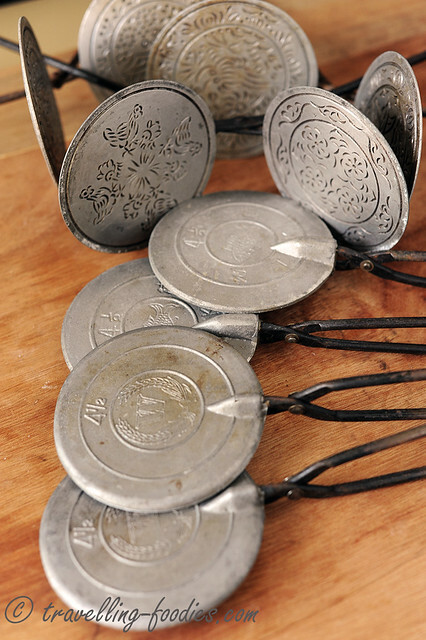 If the batter does not cling over the tilted mould well, it is not hot enough to be used. And here are my “kueh belanda making team” – Veronica from Peng’s Kitchen, Annie from Annielicious Food and Edith from Rumbling Tummies, baking kakis whom I’d known for quite a few years now. Like I’d said there is never a dull moment with good and like-minded friends around. This entry was posted on January 31, 2016 by Alan (travellingfoodies). It was filed under Food, Simple Eats and was tagged with arang api, baba nyonya, charcoal, chinese new year, kueh belanda, kuih kapit, loveletters, Nonya, Peranakan, straits chinee. Hello Alan, wow fabulous array of Chinese New Year food posts you have put up for the benefit of readers. Like you, I discarded my beautiful set of love letter molds long ago as I find it’s impossible to make this beloved snack without turning my flat into such a mess. Anyway, nice to see the three beautiful ladies making love letter snack in the picture. Wishing you and your entire family A BLESSED YEAR OF THE MONKEY. This is such an awesome post, Alan! It’s almost like I was there watching you, Edith, and all the others make this gorgeous treat! I can only imagine the conversations that accompanied. 🙂 Thank you for sharing this, and blessed CNY to you and yours. 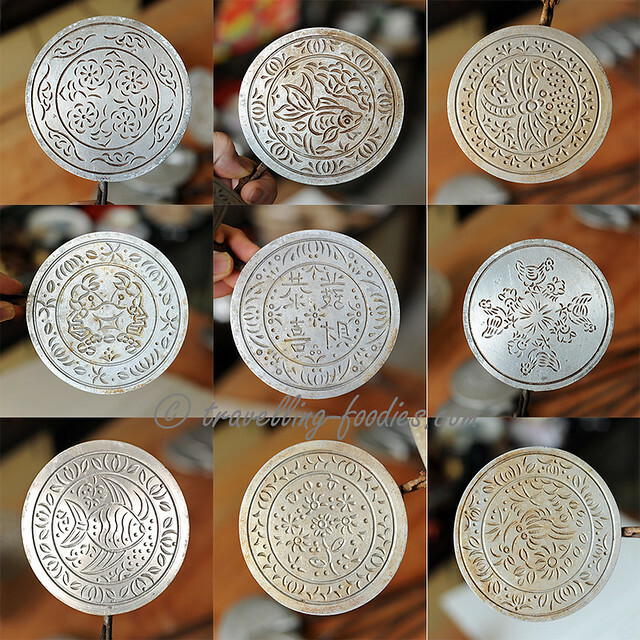 I love your post….. May I ask where can I buy the love letter moulds? Can I prepare the batter 1 day before? will placing the batter into the fridge 1 day before makes a difference? I am not sure. I have not done that before. 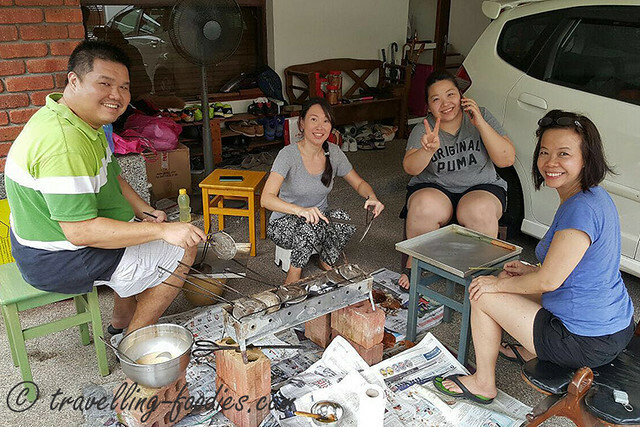 I love to see how everyone comes together to bond and bring back heritage of the families hand me down moulds. Missing those beautiful days.